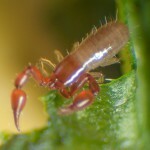 Overall this is a distinctly reddish species with the cephalothorax reddish olive green, opisthosomal tergites olive-green, and the pedipalps reddish length of body: 2.5–3.0 mm. Europe: Mediterranean Spain, Greece and into Bulgaria; northwards to the southern Tyrol, Austria, S. Carpathians; westwards to western Spain, Portugal; also France and Britain. 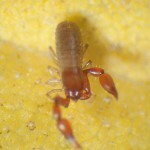 In Britain this species is apparently restricted to the southern half of England, parts of Wales and Northern Ireland. It favours dry leaf litter (particularly beech, poplar and sycamore), moss and can also be found under stones in woods. Other records have been taken from grass, in a shingle beach, in soil and beneath tree bark.